GTbank and Etisalat Nigeria has joined forces to provide registered Etisalat subscribers a very fast and easy way to own a bank account without all those paper works and IDs. It is a savings account that has also come with a lot of benefits and you can open it right away through your Etisalat line. You can deposit or withdraw money from your account at any Gtbank branch across the country. 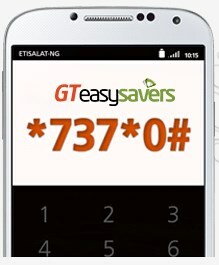 To open a GTEasy savers account, simply dial *737*0# from your Etisalat line. Have you opened the account already or you want to tell us your opinion, kindly use the comments box below this post. Remember to share this post. I deposited money to the easysavers account today at a GTBank branch near me. The account is cool anyways, thanks for the information. I opened the account via my etisalat line and i recieved a text message with my new account number but i erased it mistakenly,how do i get my account number? Don't panic, your Etisalat number still represents your account number, just take it to the nearest Etisalat outlet or GTBank branch to get your NUBAN account number. What is the highest amount that can be in the account, and how much can you withdraw at a go?